Looking to add an extension? Convert your loft or give your home a new lease of life? No renovation project is ever the same, but a proven track record can make a real difference. We’ve gathered a few examples of past project to let our vast experience speaks for itself! As they say – the proof is in the pudding! Extending Edwardian terraced houses is a great way to not only add character but, naturally, make your property bigger and more desirable. This Early 19th century Edwardian terraced house in South London had a dysfunctional, old, over-divided ground floor in need of comprehensive re-layout thinking. It also had a potential opportunity for an extension. Extending and refurbishing terraced houses while keeping as much of the original features as possible or required often results is spectacularly mixed and eclectic end-design of old and new. The owner of this Birmingham house approached us after securing permission for a rear extension to his house. 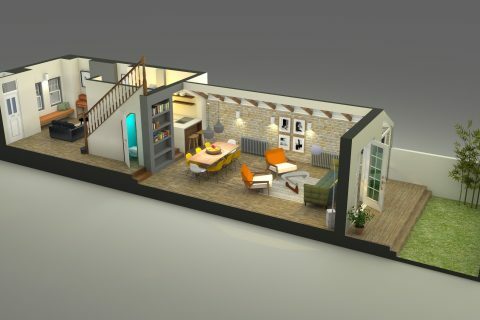 The large extension was meant to host a large open plan Lounge/kitchen/dining area which would open to the back yard. They had one design idea which they were very keen to incorporate into the design; a sunken, 1970’s style lounge area. The owners of this typical 2-bedroom semi detached family home in Yorkshire wanted to rethink the ground floor layout which to them felt squeezed and dark. They were turned away by a few architects who thought it was too small a job. Luckily – BetterSpace came to the rescue! A property developer from Newport contacted us to help him divide this space, a ground floor of an old public building, into separate residential units. Our task was to find the best way to divide the space. 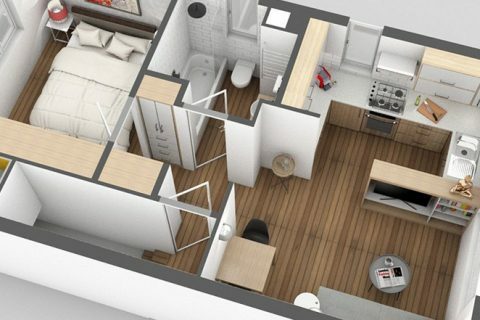 To get the most out of every piece of floor space while creating attractive flats for sale.